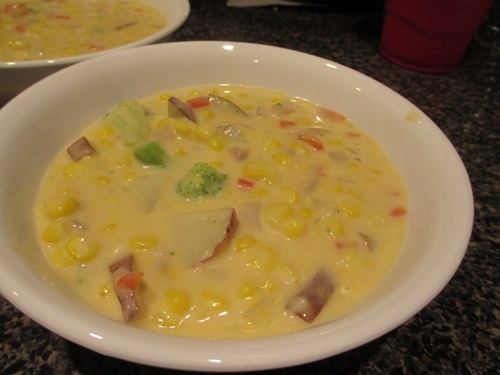 This potato corn chowder is absolutely delicious. It isn't quite Grandma's potato chowder, but it is no less tasty on a cold winter night you're in the mood for something to keep you nice and toasty. 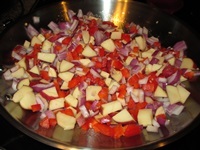 I generally use red potatoes when I make this, and I scrub them and leave the skin on, because we happen to love them this way, however, this recipe works well with any type of potato, skinned or not. Despite having to cut and/or skin potatoes, and chop a couple of veggies, this dish really doesn't require much effort to get on the table. Once it's in the pot it's just a matter of keeping an eye on it while it simmers, and giving it a good stir here and there. The prep work takes about 10 to 15 minutes (if you use all fresh vegetables) and the cook time is about 30, so you're looking at dinner on the table in approximately 45 minutes to an hour. Not bad for homemade potato corn chowder. Serve topped with a sprinkle of shredded cheese (or soy cheese), a nice green salad on the side and a warm piece of fresh baked cornbread. Wash and dice all your veggies (except the potatoes) in advance. If you've got a leftover night between when you buy your veggies and when you will be making this recipe, use it to chop your veggies for the chowder (or any other recipe you may be planning to prepare). If you do pre-prep, all you'll have to do is scrub/chop your potatoes and start cooking, so you're looking at having dinner on the table in about 30-45 minutes if you take your time. Heat oil in a large pot and saute onion, potatoes, peppers and garlic for about 3 minutes. Stir in flour and cook for another 2 minutes. 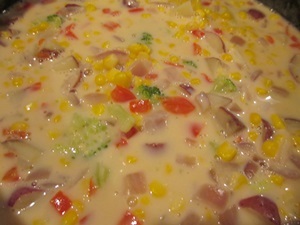 Gradually stir in milk and vegetable broth. Bring to a boil. 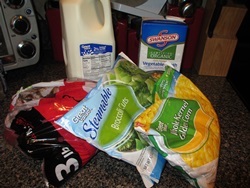 Stir in the corn and seasonings, and bring the mixture back to a boil. Reduce heat and simmer for about 20 minutes, or until potatoes and vegetables are tender and the liquid thickens and becomes creamy. Add 1/2 c shredded cheese and stir until completely melted. Spoon into bowls and top with a sprinkle of cheese (and sour cream, if desired). If the chowder is a little too soupy, add another tablespoon of flour and let it cook a little longer to thicken it up. 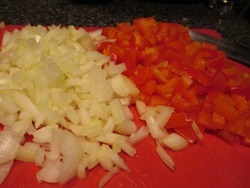 Frozen fajita vegetables taste great in this recipe, and using them saves you the extra prep work of dicing a fresh onion. As you can see from the picture above, I have also used frozen broccoli florets in this recipe. If you decide to do the same, cook the broccoli a little before adding it to the pot as it tends not to want to soften as the rest of the vegetables do. This is especially true if you used frozen cut broccoli.